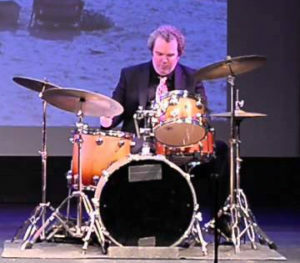 Wayne Dunton is a New York based drummer who has enjoyed a diverse career as a professional musician for almost 30 years. During that time Wayne has kept busy playing for numerous Broadway shows including Cats, Lion King, Music Man, Annie Get Your Gun, Hairspray, and Billy Elliot, among others. Wayne also played for the National Tours of 101 Dalmatians and Hair. In the jazz genre Wayne has performed and recorded with alto sax great Richie Cole’s Alto Madness Orchestra, appearing at such venues as The Jazz Standard in NYC, The Cape May Jazz festival in NJ, and the Kristianstad Jazz festival in Sweden. Wayne can be seen performing with the NY ska band Mephiskapheles and heard on their recent self titled EP. A particular career highlight for Wayne was a 2014 performance at Carnegie Hall with Ladysmith Black Mambazo featuring bassist Bakithi Kumalo, and special guest Dave Mathews, in a celebration of South African music. Wayne hopes to continue on this musical journey by playing the many different styles of music that he’s fortunate enough to encounter.